The only other race that had rebelled against the Cerik, the Delense, had been totally exterminated, but they had left a legacy—their technology and a hydroelectric plant that had allowed the Free U’tanse to live and flourish. But when it was damaged, Joshua’s people were without a source of energy to run their vehicles and filter their air. There was only one way to get the power they needed to survive—take it from the Cerik. But how could they do that without bringing down the wrath of the planet’s top predators? 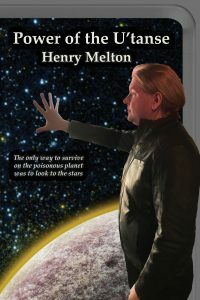 Henry Melton’s generation-spanning Project Saga examines humanity’s destiny, both in the Earth Branch where a nearby supernova destroyed our civilization and we were forced to rebuild with powerful new technologies, and in the U’tanse Branch where a psychically-gifted splinter of humanity, taken away as slaves, make their way on a world that can never be their own.